Founded in 1987, DREAM électronique is already well known and acknowledged by major fishing professionals. Its high technology and continued innovation confer to to DREAM électronique a leading position in the market.We study, manufacture, provide support and maintenance for fishing and aquaculture electronic devices. End of 2011, DREAM Electronique acquired ATI company, to expand its scope and to propose the development and design of electronic devices for research and industry. 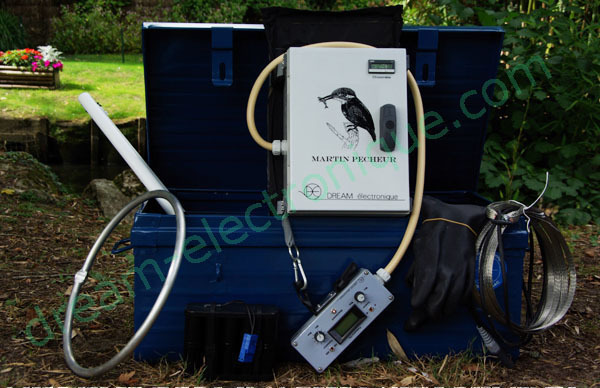 In addition to a large range of electrofishing devices, we manufacture electrical generators for barriers, remote controls, fish counters, and analytic equipments such as very appreciated AUTOMATIC CALCIMETER for geologist, sediment study or oil exploration. We study and taylor-make any special apparatus based on the specifications of the customer. The modular concept of our system makes it possible to ensure a timely maintenance. We work in close cooperation with the fisheries research workers from the National Institute of Agronomic Research (INRA) . For many years, INRA has been a pioneer in the research in electrofishing equipment. Kilometers from Bordeaux, we have an exceptional geographic situation : many lakes and rivers, Gironde estuary, Arcachon Basin and the Atlantic Ocean.